I've been so remiss on this! I just haven't been looking to see what is coming out, however, this is definitely one book that I'm definitely waiting for! From Goodreads: "Much has changed since autumn, when Kelley Winslow learned she was Faerie royalty, fell in love with changeling guard Sonny Flannery, and saved New York City from a rampaging Faerie war band. When a terrifying encounter in Central Park sends Kelley tumbling into the Otherworld, her reunion with Sonny is joyful—but cut short. For they’ve been plunged into a game of Faerie deception and wavering allegiances in which the next move could topple a kingdom...or part them forever. The fans who flocked to Lesley Livingston’s Wondrous Strange will fall hard for Darklight, the soaringly romantic second book in the trilogy. Breathless high stakes and vividly magical characters make this a can’t-miss fantasy for readers of Melissa Marr and Holly Black." Definitely cannot wait for this book! 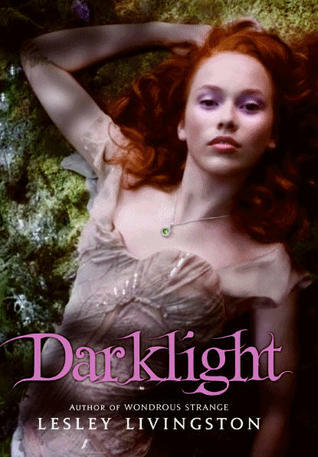 The cover for Darklight is just gorgeous! This book cover is just gorgeous. I canot wait to read it. I haven't read the first one (sitting in growing TBR pile) but this one has a very pretty cover! HOLY CRAP. I am soo excited. I love, love, loved "Wondrous Strange" and cannot wait for this one. Beautiful cover! Can't wait for Dark light.....isn't the cover so cool?